In 2-quart saucepan, heat 1/2 cup water to boiling over high heat. Add green beans; cover and return to boiling. Reduce heat; simmer covered 10 to 12 minutes or until tender. Drain; cool in colander under cold running water. Meanwhile, in shallow bowl, stir vinegar, sugar, salt and pepper until sugar is dissolved. Add onion; toss to coat. Let stand 10 minutes, tossing occasionally. Drain, reserving 1 tablespoon vinegar mixture. In medium serving bowl, place beans; top with onion. Drizzle with reserved vinegar mixture and the oil; toss to coat. Quick-pickling an onion tames its heat and gives it a beautiful pink color. 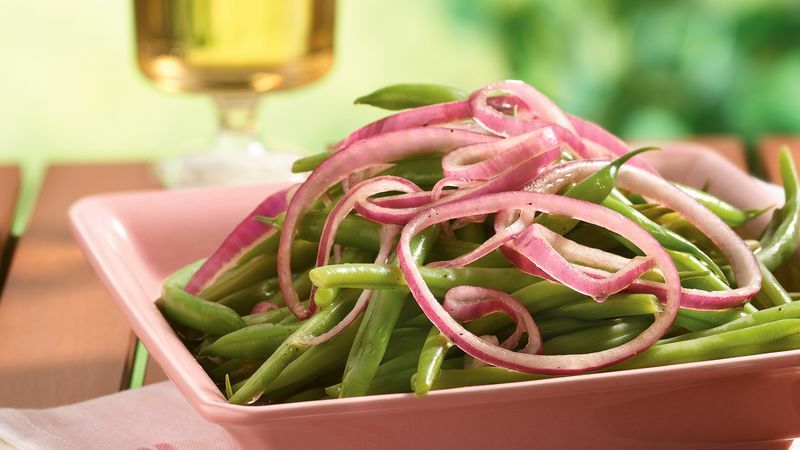 A pickled onion's flavors go well with grilled salmon, lamb or pork chops. You can cook the beans up to two days ahead, but for the brightest color, don't toss with the dressing until just before serving.